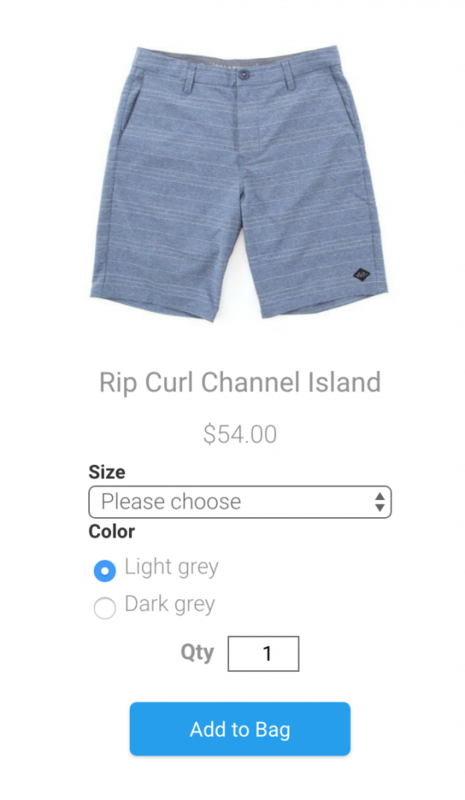 Build an extensive online store with the Ecwid Ecommerce widget. Ecwid is one of the most powerful and comprehensive ecommerce solutions on the web, providing you with a shopping cart, product categories, search capability, and a complete checkout process. Use our Ecwid Ecommerce widgets for simple integration of your individual Ecwid products, or your entire Ecwid store. Note: This documentation is for the Ecwid Ecommerce Single Product widget. For documentation on the Ecwid Ecommerce Store widget, go here. If you don’t already have an Ecwid account, set one up at Ecwid.com. Once your store is set up, your default home page at Ecwid will be your Store Management page. Set your store up as you like. Most settings here are automatically applied to your store. As you update settings, your published store will be updated immediately (if your website is published – no republish is necessary). Click on any product in your catalog. The Product ID and Store ID are located in the URL of your product page. Look for the first string of numbers in the URL and copy it. This is your Store ID, which should be placed in the Store ID field in the widget option panel in Architect. The second string of characters is your Product ID. Copy it and paste this in the Product ID field in the widget option panel in Architect. Repeat this process as needed for each Product ID. The Store ID is always the same. Place the Ecwid Ecommerce Store as desired on your page. Enter the Store ID. Acquire the Store ID using the instructions above. Enter the Product ID. Acquire the Product ID using the instructions above. The remaining options in the widget enable or disable visibility of certain options within your product display. The option titles are self-explanatory and will not be covered individually in this documentation. Buy Button Color: This setting changes the color of the Buy Button / Add to Bag button. You may notice that this setting doesn’t “remember” the color setting after you set it. This is due to the fact that the widget cannot render a preview in the editor. Once a color is set, the color will be applied properly, even though the color setting is not retained in the widget option panel. The rest of the store settings are handled at Ecwid.com. Visit your Ecwid store account to take advantage of the extensive options available. Q: I dont’ see my store when I preview my site. A: Your Ecwid store or single products will not be seen in the site preview function. Please publish your site to preview it. If you are working on an existing, published site, a good method for testing your store before you publish it is to place the store on a page that is hidden in your site navigation. Once you’ve published you’re happy with your store, you can unhide the page in your navigation. Q: I’ve published my site and when I navigate to another page and come back to my store page, my store is gone. A: The Ecwid Ecommerce widgets (both the Store widget and the Single Product widget) require the “Quick Navigation” option to be disabled. This option can be found within the Navigation Links widget: Navigation Links > Pages tab > More Design Options > Quick Navigation.